In 2007, The Star-Ledger's daily circulation was reportedly more than the next two largest New Jersey newspapers combined and its Sunday circulation larger than the next three papers combined. It has suffered great declines in print circulation in recent years, to 180,000 daily in 2013 and 114,000 "individually paid print circulation," that is the number of copies being bought by subscription or at newsstands, in 2015. The Star-Ledger was the recipient of the Pulitzer Prize for Breaking News Reporting in 2005 for its comprehensive and clear-headed coverage of the resignation of the Governor of New Jersey Jim McGreevey, after he confessed to adultery with a male lover. On January 16, 2013, the newspaper announced layoffs of 34 employees including 18 newsroom staff. The Star-Ledger, which Vezza said will continue to be published seven days a week, will retain a presence in Newark in leased office space located within the downtown Gateway Center complex — where the publisher, the newspaper's editorial board, its columnists, its magazine staff and a handful of other jobs will be based. Advance Publications, the owner of the newspaper, launched a new media company this year — NJ Advance Media — that will provide content, advertising and marketing services for its online presence at NJ.com, and many of its New Jersey newspapers out of the offices in Woodbridge. The sales and marketing staffs moved to Woodbridge in June 2014. In October 2009, managing editor Kevin Whitmer took over as editor. Prior to Whitmer, James Willse manned the helm from 1995. He was appointed following the retirement of 32-year veteran editor Mort Pye. Willse was the former editor and publisher of the New York Daily News. Prior to accepting the Ledger's editor position, Willse headed up the review of electronic information options for all Newhouse newspapers. He also expanded the Ledger' use of color and encouraged a more aggressive editorial team. The National Press Foundation named Willse its 1999 recipient of the George Beveridge Editor of the Year Award in recognition of Ledger's coverage of racial profiling by the New Jersey State Police. 8 The Sopranos creator David Chase credited a Star-Ledger story by journalist Guy Sterling with inspiring the theme for the series’ 2003 season. The Star-Ledger prices are $1.50 weekdays, $2 Saturdays & $3 Sundays/Thanksgiving Day. May be higher outside New Jersey. ↑ "How to contact The Star-Ledger". NJ.com. Retrieved 1 April 2016. ↑ New Jersey Press Association - Member Newspapers - Dailies, New Jersey Press Association; Star-Ledger data from Editor & Publisher April 2007 article. ↑ "Star-Ledger HQ on block". The New York Post. July 5, 2013. Retrieved July 5, 2013. ↑ Sherman, Ted (December 5, 2013). "Owners of Star-Ledger, NJ.com and sister newspapers studying possible consolidations". NJ.com. Retrieved 2013-12-07. 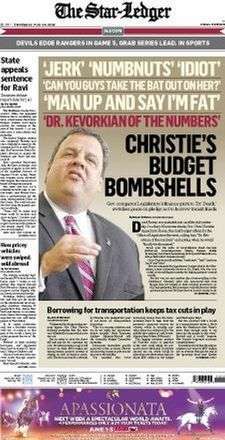 ↑ "Inside the Massacre at the Newark Star-Ledger, The Paper That Makes Chris Christie Squirm - The Daily Beast". The Daily Beast. Retrieved 1 April 2016. ↑ "THE NEWARK NEWS: IN MEMORIAM". The New York Times. 30 August 1981. Retrieved 1 April 2016. ↑ "The Press and the Suburbs". Retrieved 1 April 2016. ↑ "The Pulitzer Prizes". Retrieved 1 April 2016. ↑ "Wrestling: The history of The Star-Ledger Trophy". NJ.com. Retrieved 1 April 2016. ↑ "Larry McDermott, publisher of The Republican, announces retirement; to be replaced by Newark Star-Ledger publisher George Arwady". masslive.com. Retrieved 1 April 2016. 1 2 'Star-Ledger' Publisher Threatens January 2009 Shutdown, September 2008, Editor & Publisher Archived September 18, 2008, at the Wayback Machine. ↑ Official: 40% of 'Star-Ledger' Newsroom Exiting, October 24, 2008, Editor & Publisher Archived October 27, 2008, at the Wayback Machine. ↑ "Star-Ledger axing 34 employees". CBS local. January 16, 2013. ↑ "Newark headquarters of Star-Ledger sold to New York real estate development firm". NJ.com. Retrieved 1 April 2016. ↑ "Advance Publications forms new unit". NJ.com. Retrieved 1 April 2016. ↑ "Advance Publications, Inc.: Private Company Information - Businessweek". Retrieved 1 April 2016. ↑ Roger Yu (June 27, 2013). "Future of some major newspapers about to change". USA Today. Retrieved March 5, 2014. ↑ "Star-Ledger Editor Jim Willse announces retirement, names successor". NJ.com. Retrieved 1 April 2016. ↑ "Jersey cases inspire new 'Sopranos' season". NJ.com. 2003-01-09. Retrieved 2016-08-10.